By far, the most common use of the Vault API is to provide some sort of integrations with something else. Sure there are some good utilities up on the App Store, but they don’t represent the majority of the cases. Consulting is where it’s at, and there are a surprising number of systems out there to connect Vault to. Each integration is different, so there is no way for me to tell you everything you ever need to know. However, there are certain patterns that emerge, and it’s the patterns that I will be focusing on. The first pattern is the one I used when designing the SharePoint 2010 integration. One system provides a view of data in another system. 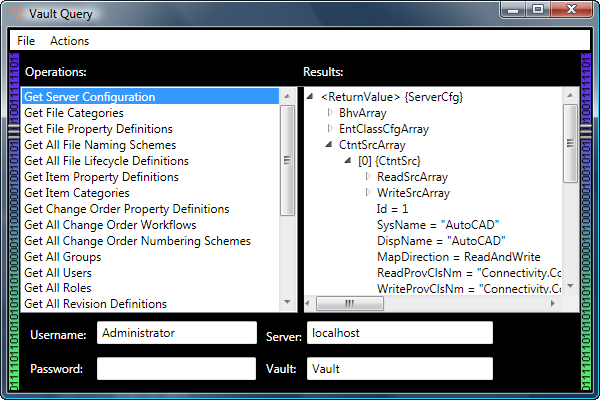 In this case, SharePoint 2010 provides a view Vault data. If you do it right, the end user should not know (and not care) that the data is coming from an outside system. The SP integration does this very well. Here is a game you can play. Look at the following video and try to figure out what is the SharePoint data and what is the Vault data. One cool thing about BCS, the SP feature I used for the integration, is that it doesn’t just provide a view of external data. BCS allows you to link SharePoint data with external data. This is a pretty useful feature for integrations like this. If you can’t link the data between the two systems, then the integration loses a lot of value. The end user may as well just use two separate applications. I’ll end the article with some quick bullets on the advantages and disadvantages of this pattern. If I left anything out, please let me know in the comments section. Performance - Constantly pulling data from another source is time consuming. No matter how much you optimize things, it will never be as fast as having the data in the same system. For SharePoint, we found that the distance between the SP server and the Vault server was the biggest factor in how quick the Vault pages came up in SP. Network Dependency - If the network ever goes down between the two systems, the integration is effectively broken. People who rely on the data will no longer be able to access it. This month's app is an update of Vault Query. It’s a cute little program that reads Vault data at the API level and displays the results in a similar format to the Visual Studio debugger. It’s good for things like figuring out what the system name is for the UDP you want to read. New for 2013, you can export the results to an XML file. A lot of times, I find it easier to sift through an XML file instead of dealing with a tree view. Click here for 2011 version. Sorry, there is no 2012 version. On the left you have a list of operations. Each operation represents a single web service call with specific input parameters. Double click on the operation and it runs. The output is presented in the right pane. I set up a bunch of operations out-of-the-box, but you can add your own. 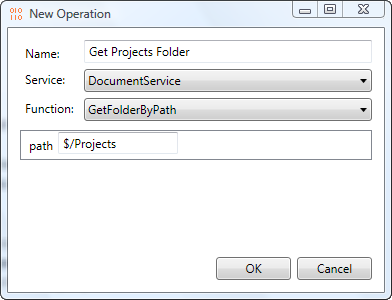 You can either use the "Add Actions" command or edit the Operations.xml file. In theory, any API call can be made into an operation. However the UI is picky about what input types it supports. You may need to edit Operations.xml for many cases. Although my official job title is “Software Engineer,” my API knowledge makes me an honorary member of the tech support team. More often than not, I read a problem and don’t have enough information to answer it properly. This requires me to respond asking for more formation. Usually one or two more back-and-forth sessions are needed before the question is finally answered. This process is a wasteful, especially when different time zones are involved. If you figure that each back-and-forth takes 24 hours, there is a definite benefit to reducing these round-trips. So here is a list of things you can do to make the process more efficient. The goal is to provide all the needed information upfront so that I don’t have to go back and ask you to elaborate in more detail. Is it Vault Basic? Vault Professional? Is is the 2013 version? Each product has a different feature set and the API may change between release years. If the server returns an error, don’t just say “the server throws an error”. Tell me what the error code is. Don’t leave me in suspense. I even have some code snippets you can use to extract the error and restriction codes (if any). Sometimes people will post their entire project and expect me to debug it. That’s not a good use of anybody’s time. If you are going to include source code, it should be isolated to a single function at most. If you are sending a block of code and are getting Exceptions, you need to indicate clearly which line is causing the breakage. It’s amazing how much information is conveyed in a screenshot. Even if the Vault is in a different language, I can usually figure out what is going on based on the icons and dialogs. Videos are great too. If you find yourself taking 4 or more screenshots, it may be easier to just record a video. ToString is the best thing to happen to debugging since the print statement. Don’t be afraid to use it and include the full stack trace in your problem report. Even if you don’t understand it all, it may make sense to me since I have access to the Vault source code.